We are happy to serve our loving community and those who are just here to visit. Welcome to The Garden Café at Crazy Daisies! Welcome to our Garden Cafe at Crazy Daisies! In accordance with our love for agriculture we’ve added a locally grown cut flower program as well as a NYS Agriculture and Markets Farm Brewery license which allows us to serve NYS only beers, wines and cider. In addition to what we produce here we work with other local farms and businesses to offer you the freshest local products available. Some of the local vendors that we work with are Salt City Coffee, 2 Kids Goat Farm, Dutch Hill Maple, Hiwire Honey, Oliver’s Produce, Rohe Farms, Kowbell Farms, Pasta’s, Red Gate Grocer , Local 315 Brewing Company, 1911 to name a few. We’re proud to offer you scratch cooking with fresh, local ingredients. Saturday and Sunday: Breakfast Sandwiches and Brunch, Mimosas, Bloody Mary’s until 2 pm. Small Plates until closing time. Are you having a small event and would like a rustic but elegant venue? Let The Garden Café at Crazy Daisies be your go-to destination! We can seat up to 30 people inside and have a wonderful variety of fresh and creative food options, please come and enjoy! 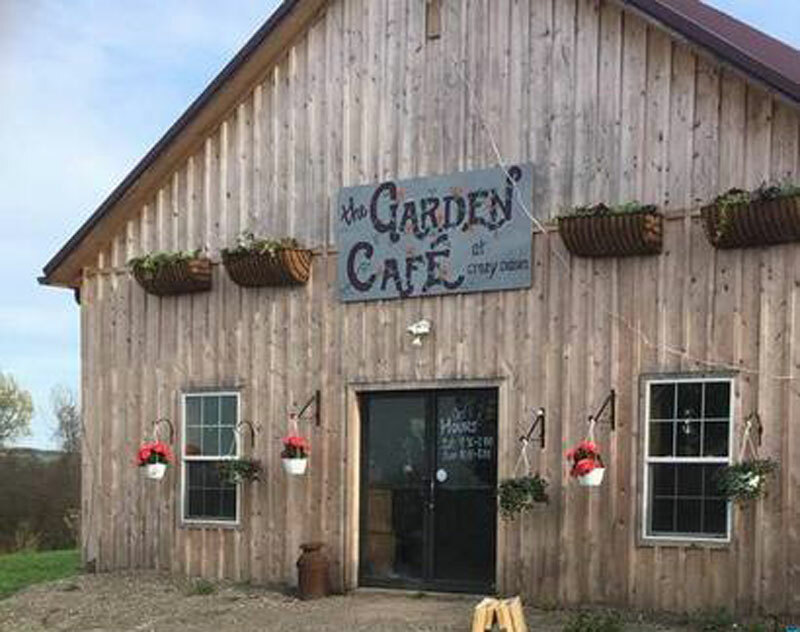 View our On-site Party Planning Menu below to see pricing and special menu options that are available only when you host your party at The Garden Café! Feel free to check out or upcoming events, purchases tickets, and more. We supply a 12″ container, soil, plants and instruction for you to design an original creation and you leave it here to grow in until the first week of May. Book your own private garden party by reservation. Come Enjoy brunch at the garden cafe. Made with all local farm goods, served alongside recess coffee. Great place to get plants. Every plant I’ve ever purchased never needed anything more than a good watering routine. A seasonal visit every year! Beautiful place with beautiful people. They have a cafe that serves ingredients from the farm, so everything is fresh. They sell all sorts of veggies, baked goods, flowers, succulents, and seasonings.